Do you go to the First Thursday Art Walks downtown? The First Thursday of every month (barring when holidays kick it to the following week, as the 4th of July did in this instance) sees many of the downtown galleries open an extra hour or two, and hosting the opening of whatever new show is up that period. The epicenter of it all is 49 Geary, home to some of the most respected art galleries in the city (and country). 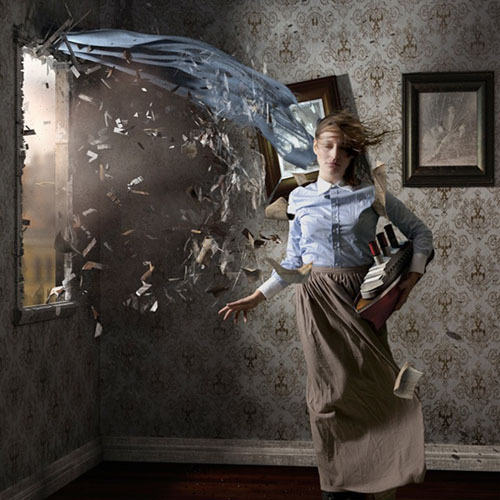 Tonight, Modernbook Gallery presents photographer Jamie Baldridge’s new series Almost Fiction, featuring his digitally-manipulated, surreal narrative photographs. Baldridge will also be at the gallery signing copies of the series’s book, published by Modernbook Editions. Robert Koch has the opening reception for photographer Joshua Lutz’s non-linear narrative of his own mother’s battle with mental illness, Hesitating Beauty. At Haines Gallery, there is the opening reception for Congolese artist Aimé Mpane’s portraits made with plywood, glue, and finishing tools that date to the Stone Ages, and which explore the lingering effects of the Belgian Congo’s colonial history in A Dual Perspective. Today is also the last day one can see Tahiti Pehrson’s circadian rhythm-inspired cut-paper sculptures at K. Imperial Fine Art. A circadian rhythm is any biological process produced or synthesized within the organism or system where the internal physiological or behavioral events match the oscillation of 24 hours. You don’t want to miss that! In addition to the openings and the ongoing shows that can make the First Thursday Art Walk a bit overwhelming, gallerists, curators, and even interns are often introducing the work and are available to answer questions. These are the people who know the work and its context better than anyone, and discussions with them are often as educative as they are enjoyable. Miniscule plastic cups of wine are also on offer, in case you need (very little) liquid courage to approach them.